A Most Beneficial Yantra of Shri Vishnu Bhagwan, the Protector of the Cosmos has been described by me in this Post. This Vishnu Yantra can be extremely helpful and auspicious for dedicated Vaishnavites and other Vishnu Bhakts. 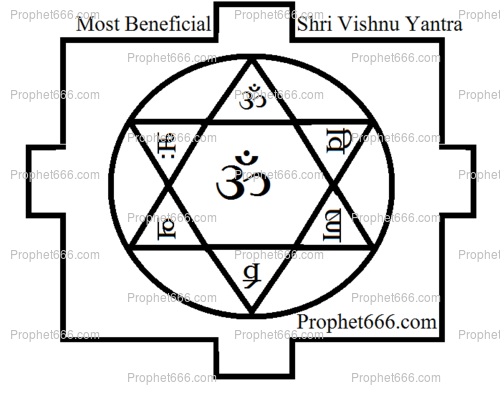 The Vishnu Yantra has the potential to harness immense Satvik and Rajsik Powers to aid the devotee in spiritual, religious and material matters. 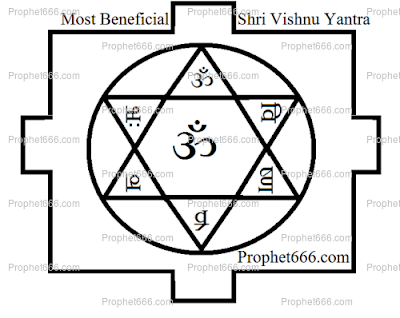 The Vishnu Yantra, which, I have shown in the image has to be prepared on Copper on any auspicious Tithi, festival, Nakshatra or Astrology Yoga. It should be installed in the Puja-Place, Altar or any other Pure and Clean Place in the house on a Shukla Paksha Ekadashi [this is the 11th day of the Bright Half of the Hindu Lunar Fortnight}. Then, the Yantra should be worshiped with Dhoop/Diya and Fresh Flowers and the Sadhak should chant the Vishnu Mantra given below for 1008 Mantra Chants, a Tulsi or Baijanti Counting Mala is best suited for this purpose. The Mantra Chanting should be continued until the coming Krishna Paksha Ekadashi [11th day of the Dark Half of the Hindu Lunar Fortnight]. On the day of Krishna Paksha Ekadashi, the Sadhak should worship the Shri Vishnu Yantra and then offer a Prasad of Fruits to the Yantra. Offering 11 Tulsi leaves daily to the Shri Vishnu Yantra is considered to be extremly beneficial and auspicious. This Guy is just making a mockery of the site.. Needs to be banned !! You must know the difference between 'Comment' & 'Article'. My comment was intended for previous comment and not for article. Don't judge too Quickly. My question is not a mockery. I asked the wrong question. I mean a mantra to HELP for exams, or to help us get the driver's license. I live in France, in France the exam of traffic laws is difficult. What I'm looking for is in the site on brain mantras and saraswati mantra. I hope Neelji does not consider it a mockery. Excuse me ji. Every day I look your site. Excuse me for any error in my english.